Tom Palmer took the road less travelled to England honours, beginning his career with a second division Leeds in 1997. Having been spotted by Leeds boss Phil Davies while playing for Leeds University, Palmer was drafted into the Tykes' Under-19 side during his first year at college. 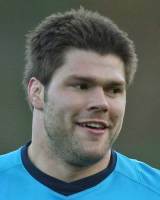 During this time Palmer also represented Scotland Under-19 and Under-21, who he qualified for through residency in Edinburgh, before being drafted into the Leeds first team squad in 1998. His debut for Leeds came in 1998 against Blackheath, but he firmly established his place in the side the following season, missing only four games throughout the campaign. Palmer was selected for England 'A' duty while still playing in National One, which Leeds finished top of in the 2000-01 season. His strong work over the preceding season led to his inclusion on England's summer tour to the USA, and he became the first Leeds player to play for England when he replaced Steve Borthwick against the USA in San Francisco. The following season was Palmer's first in the Premiership, although he was limited to 15 appearances after breaking his leg in an England 'A' game. Serious injury struck again in 2003, when, following a spell with the senior side, Palmer suffered a knee problem during the Chruchill Cup that ruled him out for six months. He collected a Powergen Cup winner's medal in 2005 after Leeds' victory over Bath at Twickenham, but his side were relegated from the Premiership the following season, and Palmer chose this time to leave the club. After over 100 appearances for Leeds he joined London Wasps in the summer of 2006. He won both the Heineken Cup and Guinness Premiership with Wasps, before announcing that he would be joining French Top 14 side Stade Francais for the 2009-10 season alongside fellow Wasps and England forward James Haskell. Palmer continued to turn in eye-catching performances for the Parisian giants and in 2011 started every Six Nations match for England. He marked a great season in the red rose jersey by being named in Martin Johnson's 30-man squad for the World Cup and in early 2012 - while maintaining a place in a new-look England side - he confirmed his return to Wasps on a two-year contract.